The rent at Mission Bay Apartments ranges from $1,352 for a one bedroom to a $1,234 two bedroom. Apartments in this building are about 8% less expensive than the Orlando average. This is a pet-friendly apartment. This apartment is in Orlando. Nearby parks include Blanchard Park and Eddie Graham Sports Stadium. Mission Bay Apartments has a Walk Score of 45 out of 100. This location is a Car-Dependent neighborhood so most errands require a car. Tucked away amid swaying palm trees and resting next to the beautiful waters of a private lake, Mission Bay in East Orlando, offers relaxed tropical charm in a picturesque setting. Our community is conveniently located just minutes from downtown Orlando, Waterford Lakes, and the University of Central Florida. In some cases, applicants may be required to submit a Guarantor Application. Please call for an appointment today. Explore how far you can travel by car, bus, bike and foot from Mission Bay Apartments. Mission Bay Apartments has minimal transit which means it is possible to get on a bus. 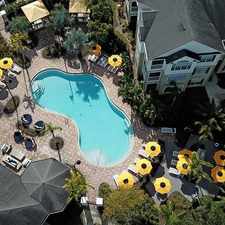 Mission Bay Apartments is in the city of Orlando, FL. Orlando has an average Walk Score of 42 and has 238,300 residents.